Newest Exhibit is the Oldest Exhibit! The Ashbury & Company four wheel passenger coach body .. The Museum was extremely pleased to receive its latest exhibit yesterday – the Ashbury & Company four wheel passenger coach body, built for the Great Eastern Railway as their No.514 in 1869. The coach will become our dedicated visitor passenger vehicle when its running and brake gear are restored and the coach is restored to its former glory. The coach is pictured on its temporary accommodation chassis which it will occupy for transit into our workshop. As described in our blog update on 14th January 2013, the history of the coach is remarkable as it was retired from railway service as long ago as 1910, then being used as a coal order office in Newport, Essex until it was preserved at the South Cambridgeshire Rural Railway Museum in the 1970’s. Surviving in an extremely good condition under a corrugated steel roof, the coach was lifted from its home onto a lorry and made its furthest journey from the Capital in its 144 year life yesterday, to an accommodation chassis at the Museum in Cottesmore. The coach will be displayed for a short while but the intention is that it will enter our workshops for assessment and separation of body from chassis in order that reinstatement work can commence. The project will become the central group volunteer project as the coach is stripped and rebuilt over the next few years. The coach was originally built for Victorian commuter services, primarily from Liverpool Street to Enfield, Hertford and Epping and has five ‘open’ compartments, where the wooden bench seats had little in the way of comfort for third class passengers. In the early days, even lighting was out of reach for third class passengers but we are planning on being a little more accommodating with our visitors! We would welcome volunteers for this project and donations for materials, in our attempt to return a very historic vehicle to operational service. The Museum thanks Mr Bob Drage and transport contractors Deeping Direct Deliveries for their support and assistance with this project. The long awaited steaming of our two Barclay locomotives in the same shift – SIR THOMAS ROYDEN and 1931 – took place at our March operating day. Reminiscent of an early morning quarry loco shed scene, the day started with a fantastic sunrise as the two veteran locos gently started to raise steam even before visitors were awake to start their journeys. As a precursor to the unseasonal weather, we were faced with deteriorating conditions from around ten am with heavy snow falling throughout the middle of the day. The two locos performed faultlessly with the innovation of a trainload ‘attacking the bank’ at the beginning and end of each shift change. With two steam locos in operation, we were also able to ring the changes during the day to allow quarry and passenger operation with both locos. The day was a real treat for enthusiasts and photographers alike as some truly spectacular wintry scenes were experienced. With some fantastic feedback, we hope to incorporate the innovations into our regular operating days in the future. You will recall that we acquired a rare wagon from the York Group of the NYMR last year with a strong suspicion that it was an early private owner iron ore hopper wagon. It is the sole survivor of three wagons latterly used, and heavily modified by Rowntrees of York before its operational life in preservation at the North Yorkshire Moors Railway on loco ash trains. Recent research and a chance find of a photograph on eBay, showed an identical wagon at Scunthorpe in around 1950. This photo is significant as it shows a wagon of this type lettered to show its owner at nationalisation – Richard Thomas & Co. as well as its allocated nationalised number P64965. The Richard Thomas & Co. business ran steelworks at Redbourn in Scunthorpe and Ebbw Vale in South Wales with iron ore mining interests in the East Midlands at Blisworth, Finedon, Hunsbury Hill and Irthlingborough. The steelworks at Scunthorpe were originally developed in the early 1900’s by the Redbourn Hill Iron & Coal Company and were hugely expanded in the latter part of the First World War. The entire output of pig iron was taken by Richard Thomas & Co. who eventually bought out the company. We therefore deduce that the wagon, which was built by Midlands manufacturer W. Rigley in around 1910, was acquired by the Richard Thomas & Co. through its business acquisitions but would have been taken into nationalised stock in 1948. Given the timeframe for our museum, after restoration of the bodywork to its correct profile, the wagon will assume the P64965 identity of the example in the photo. The future of the last remaining quarry train at the CEMEX Barrington Cement works has been secured following the company’s decision to donate the locomotive and two remaining wagons to Rocks by Rail. In February 2005 the last working standard gauge quarry railway in the UK finally succumbed to the pressures of modernisation at the Barrington Cement Works in Cambridgeshire. The cessation of the internal movement of quarried material from the quarry face to the works by an internal industrial railway signalled the end of nearly 200 years of industrial history which can be traced back to the very dawn of the creation of the railway age. The quarry railway atBarringtonwas subsequently taken up in favour of modern methods of mineral excavation and movement. 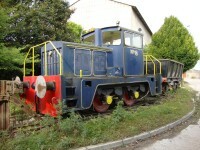 The plant was acquired by the global materials company CEMEX in March 2005 and in recognition of the significant part played by the quarry railway, it was decided that a quarry loco and two wagons were to be retained and preserved on permanent display on a short length of line within the works. However, due to the recession the Barrington Cement works was mothballed in late 2008, but the quarry train remained on-site. However the decision has recently been made that the Cement Works will not now re-open and the initial phase of de-commissioning of part of the works is nearing completion. 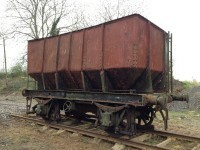 As a result there was some concern regarding the eventual fate of the surviving preserved quarry rolling stock at the Barrington Plant but a solution has just been announced whereby CEMEX, recognising the importance of these items to the industrial heritage of the area, has agreed to donate and entrust the items to Rocks by Rail. Consequently plans are being made to move the items to the museum’s site at Cottesmore, where they will join our unique collection of quarry rolling stock. In addition, to the donation of the rolling stock, the Rugby Group Benevolent Fund, a charity with close links to the company has provided a grant of £5,000 to cover the cost of transporting the loco and wagons to their new home and creating supporting information for display at the museum. “Through this generous act CEMEX have safeguarded the future of historic quarry railway items which they were originally instrumental in saving. We are very grateful for their support both now and in the past. Once the items arrive at the museum they will supplement the other rolling stock that we have already received from the Barrington Quarry Railway”. 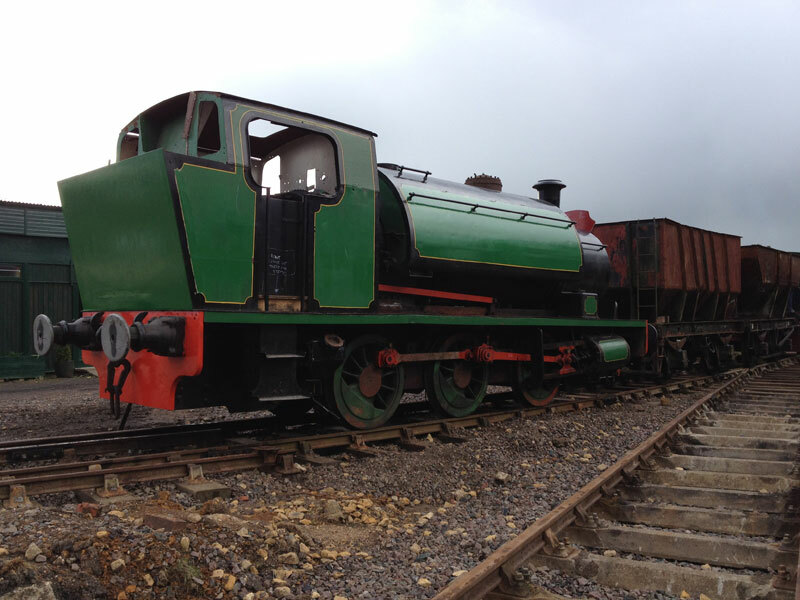 The arrival of the wagons will enable the Museum to form a genuine quarry train consisting of a loco and four wagons which can be operate in our quarry very much in the same way as they used to work at Barrington. The wagons arrived at the Museum on Friday 28th September and with the loco to follow, the exhibits will arrive at the museum in time for their initial display on Sunday 21st October 2012 at the next Museum operating day. On Tuesday 3rd July 2012 locomotive Andrew Barclay 499 left the Museum to return to work in industry! The Heritage movement is used to housing exhibits as they retire from work so the Museum was extremely pleased to assist W H Davis Ltd, railway wagon manufacturers based at Langwith Junction, Mansfield when their regular works shunter broke down recently. The locomotive was serviced and brought back into traffic at short notice to assess its suitability for the intended use at the factory which is engaged in building the large 60 foot long modern designs of wagon regularly seen on Network Rail these days. The Museum has carefully tracked and monitored surviving locomotives and rolling stock used in the east midlands ironstone industry. One such survivor is British Railways 22 ton iron ore hopper built at Shildon in the 1950’s as running number B436275. Despite being built in huge numbers in a programme to modernise industry and rail transport, we believe that this wagon is now the only intact survivor. The wagon forms part of the national collection in the care of the National Railway Museum but they were only too happy to support our unique project by loaning the wagon to our Charity, realising that operation and display in an authentic environment would give visitors a far greater understanding of the relevance of the vehicle. B436275 arrived just before Easter from NRM Shildon and allowed an immediate display to be staged in our quarry area with the wagon running demonstration runs over the weekend. Initial plans are to carry out only superficial conservation and preserve the workaday appearance of the wagon although in due course the wagon, which is in very good mechanical condition, will be run through the workshops. The Charity thanks the support and help from the National Railway Museum through this loan. A Ghost Returns to its Old Haunts! When the huge Exton Park quarry system dieselised around fifty years ago, the resident fleet of distinctive steam locomotives were displaced and now only one or two of the type survive. It was with a great deal of pride that we welcomed part-restored Yorkshire Engine Company No.2521 to the Museum collection in early April 2012 to recall the use of these locomotives on the Exton Park system and over our Museum site. The locomotive, which is part of the National Coal Mining Museum collection, was built in the same series as those used at Exton Park but was allocated to work at the Appleby-Frodingham works at Scunthorpe in Lincolnshire as their No.9 until sold off to the National Coal Board in its last years of operation. 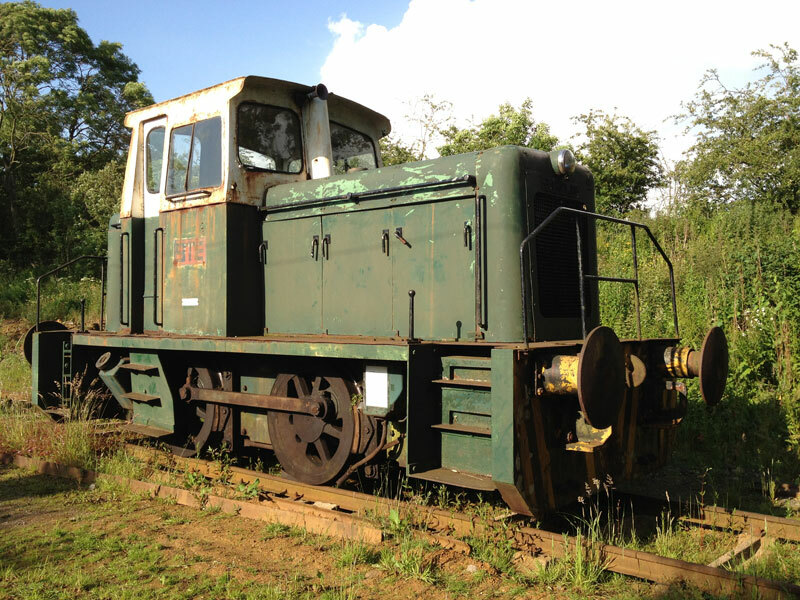 The restoration of the locomotive will allow the distinctive Exton Park livery used by the Ore Mining Branch of the United Steel Companies to be compared and contrasted with the similar livery carried by the Janus diesel engine DE5 which superseded the type and is already part of the collection. We hope to reunite two retired Exton Park footplate crew with the locomotive as soon as the conservation work is carried out. We thank the support of the National Coal Mining Museum and the custodian group, The Chesterfield Locomotive Carriage & Wagon Group. Few wagons survive from the early pioneering days of quarrying in the east midlands so the Museum was intrigued to hear that a steel hopper wagon based at the North Yorkshire Moors Railway might be a unique survivor. 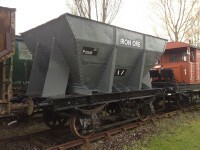 Preserved from the Rowntrees factory in York for use as a service vehicle on the famous tourist railway, the wagon became surplus to requirements and was offered for sale to the heritage railway sector. Our research suggest that the wagon was built by the Nottinghamshire wagon builders W Rigley in the early 1900’s to one of their standard designs offered for private owner mineral traffic. 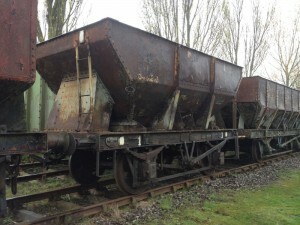 Examples were purchased by the Great Western Railway for internal use on coke and loco coal traffic in 1907 but these wagons were also used for iron ore traffic particularly some of the South Wales iron & steel manufacturers. 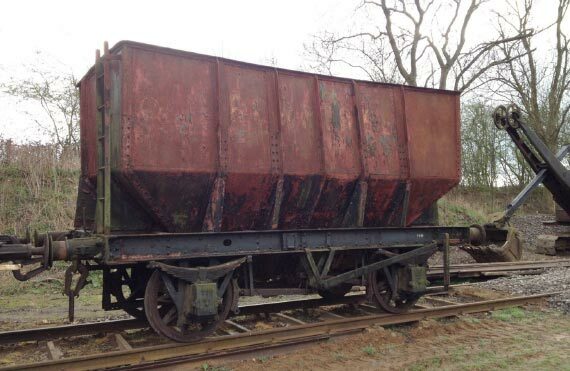 The wagon joined the collection in March and will be rebuilt and restored with its lower height side sheets and will join our operational hopper fleet as a now unique 15-ton capacity vehicle to bring additional and authentic variation to the range of wagons in service. The Museum thanks the York Area Group of the NYMR for their help and assistance in the project. We regularly host volunteering days with local schools, groups and companies. On 10th October 2011 we were pleased to welcome back a party of young volunteers who attend the local Oakham School. While many of the groups were involved in assisting with the major Museum rebuilding project, a team of young women were able to capitalise on the earlier preparation work undertaken by Museum staff, when they completed the repainting of our Charles Roberts hopper wagon into a suitable livery to fit with the curatorial timeline. The Charity was particularly impressed with the standard of work and extremely pleased that while its regular volunteers were engaged with ongoing infrastructure projects, a fine example of exhibit restoration could be completed. The wagon has now been lettered complete with a suitable running number which coincidentally reflects the date of the restoration and has joined our operational fleet of iron ore wagons. If your group or company would like to take part in a volunteering day at the Museum we would be pleased to hear from you. We try to organise small projects that can be completed in a session so that volunteers can feel that sense of satisfaction in making a big difference through their efforts.